Joining the launch party back in June were Endrey and Chasing Rabbits, who re-formed especially for this event! All raffle proceeds from the day supported the great work of Little Oak Sanctuary. 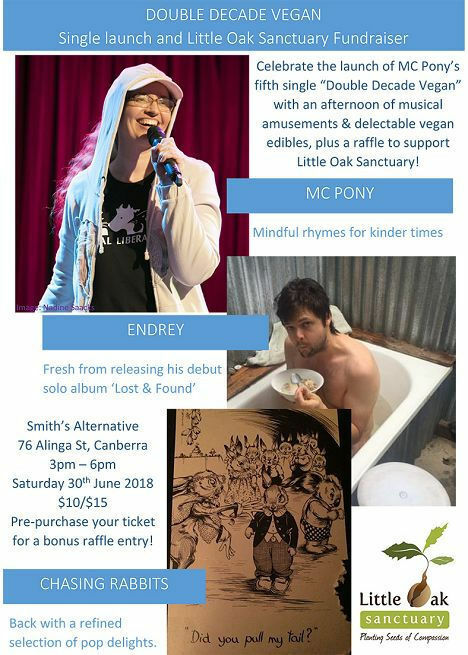 In April last year, MC Pony launched her fourth single "Mother and Child" at a special fundraiser for Animal Liberation NSW. The song is about dairy cows and their calves, and was co-written with James Donnelly. This followed hot on the heels of her recent launch of "Born to Die", a song about 'broiler' chickens co-written with Robert Pearce. 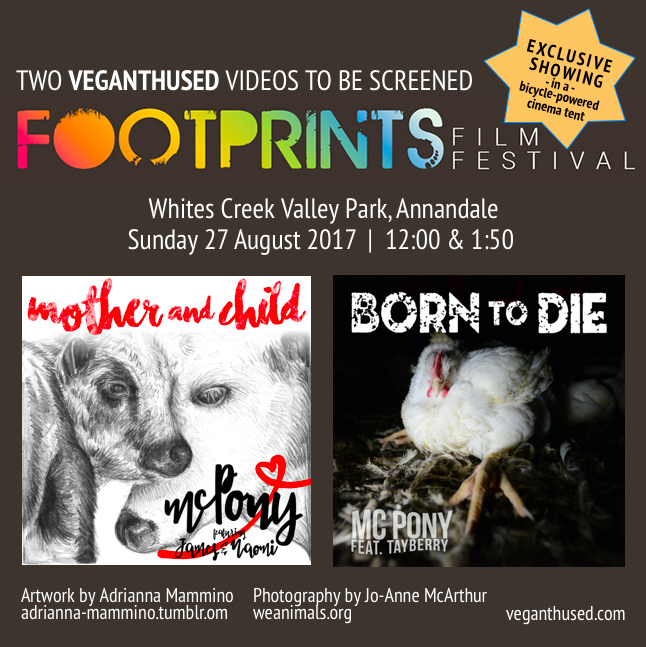 Both these videos were screened twice as part of the 2017 Footprints Film Festival. What an experience it was to watch them on the big screen in a bicycle-powered cinema! They have since been included in several other film festivals, and won multiple awards - I should have written several blog posts to cover all this exciting news, but a summary is available at the Accolades link. The woman behind the ponytailed-character is Elizabeth Usher, who has done poetry readings, presentations, and performances in Australia, the US and the UK. She has big plans for the rest of 2017 (and beyond! ), including starting to blog more than sporadically someday soon… Meanwhile, she’s busy writing more songs, working on some sweet new Veganthusiastic videos, and enjoying the memories of her 18th Veganniversary celebration back in June last year!